It is located in fan stack at the top of tower (deck part). Its duty is to pass the air, which provides the vaporizing as the main principle of tower , through the tower. It absorbs the air in exterior environment conditions( humidity and heat) over the blinds, passes through the cooling fills, sends away from fan stack by throwing to the atmosphere. 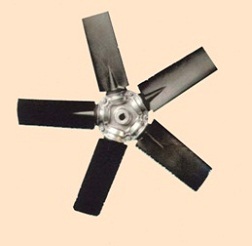 Fan panels are produced from Fiberglass Reinforced Polypropylene , FRP (Fiberglass Reinforced Polyester), aluminium pultrusion profile or PP (polypropylene) material. In small fan Diameters, FRP or PP (polypropylene) panels are used. Panel connection tables are made of aluminum alloy with injection method. 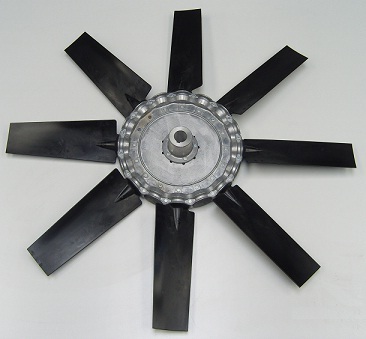 In big (Ø ≥ 2450mm)fan diameter groups, fan panels are made of FRP or aluminum pultrusion material. 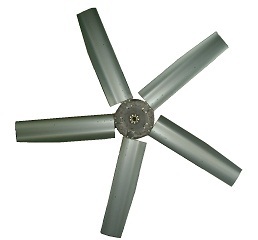 Fan tables are made of carbon steel. Tables are cataphoresis after the machining.